Have you ever had the wintertime blues? Trust us: everyone gets them! 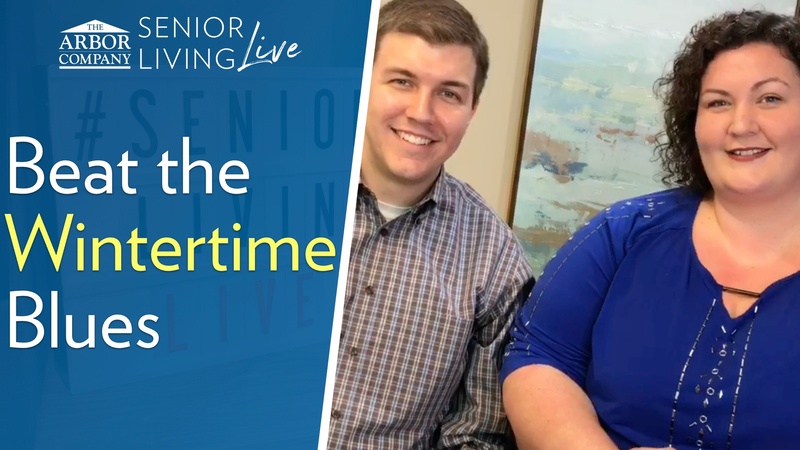 Watch our episode of Senior Living LIVE as we discuss ways that you can beat the wintertime blues and live fulfilled days. Watch below or read the transcript of our conversation. Feel free to ask any questions you may have in the comments, and we will be sure to answer them. Would you like to be part of the conversation LIVE? Click here and we'll send you a special message in Facebook Messenger when we go live. And, if you'd like to watch past episodes of our live broadcast, you can find them here. Chris: Do you have the wintertime blues? You know what I'm talking about. It's the time of year when it's after the holidays and it's before spring, and there's not much going on, right? And you wonder if winter is ever going to end, and things can get a little bit lonely. That's the wintertime blues. That's what we're talking about today on Senior Living Live. Hey, everybody. I am Chris, and this is Senior Living Live. This is a show that is designed to dig deep into the world of senior living and give the answers that you need so that you can make informed decisions and live the life that you want to live. That is our mission. And I'm so happy to be joined today by Becky. How are you doing today, Becky? Becky: Thank you for having me. Chris: Oh, wonderful. We're so happy to have you. Well, Becky is the engagement director at one of our communities here in the Atlanta area. And I wanted to bring someone from our engagement team on the show today, because they're the ones who specialize in keeping people's lives fulfilled on a daily basis. Chris: I mean, that's what you do. And I can't think of a better person to talk about this than Becky. We were just talking about her background history a little bit. So that's fantastic. And I also want to say that we are so happy if you are joining us live here on Facebook. We want to hear from you. So, please let us know that you're watching. Write down there in the comments. Don't be afraid. Just, you know, give us a little shout-out, a wave, an emoji—you know, pick a fun emoji. We love that. Chris: We could combine...and ice skating, yeah. We could combine those together, makes s’mores or something, you know. Chris: Shopping. But you find some of these obscure items on Amazon and start reading the reviews. That can be really funny. So, just Google funny Amazon reviews and you will be up all night laughing. That's a great wintertime activity. I've got Patrice here. Patrice ... oh, Patrice Kelly. You know Patrice Kelly, right? Becky: Yes, I do. Hey, Patrice. Chris: Hello, Patrice. How are you doing? I've got Mary here. So, Mary enjoys making a collage from magazines. Personally, she likes making ones that have to do with dreamy summertime gardens and inspirational quotes. So, yeah, you just dream of summer, right? And you're kind of think about what's going to be coming your way in a few short months. We've got Len and Penny are here. Chris: Your girls, they're here. Len loves her hot chocolate. So, I got ... I'm there with you, Len. Do you do put marshmallows in it? If so, I tell you what? Everybody watching, if you like marshmallows in your hot chocolate, give us a thumbs-up because we want to see that. Chris: So, that is fantastic. So now that I'm thinking about it, you know, we're talking about those wintertime blues, and if you have a tip for how to beat the wintertime blues, we're going to talk about some of those. But, you know, maybe it's something that you've done yourself or you just have an idea, we want to hear about those. So, leave them in the comments and let us know what you do. And I'm sure that there are things that we didn't even think about for the show that we're doing today. And we'll be happy to talk about those. So, Becky, before we jump into the wintertime blues, let's back up a bit. And I was wondering if you could tell us about your job a little bit, like what is engagement in a community? And why in the world is that important to us? Becky: Yes, we've been engaged—but think about an engaging experience and the difference between maybe just putting a movie on at home, at the fireplace, and you enjoy that as long as the phone doesn't ring or something distracts you. But the difference in that and maybe going to the theater. So there you're surrounded by, you know, the smell of popcorn and, in Atlanta, Coca-Cola. Chris: Yeah, of course. Yeah. Becky: Of course. And the big screen and you're with a bunch of other people experiencing it together. And that is much more of an engaging experience. So, we try to think about that when we plan activities, right? We try to make the sights and sounds and the environment support the activity that we're doing; it makes it a more engaging experience. But I think the part about our Engaged Lifestyle programs that's so important is that, because it gives our seniors opportunities to touch on many dimensions of wellness. We give them opportunities every day to keep a life balance going with spirit—you know, things that touch their spiritual needs—and rest, fun and recreation, educational opportunities, and ways to be productive. All those kind of things, so that every day they're given all those opportunities to stay active and well. Chris: Yeah. Meaning and purpose. And one of the things that I said earlier that we want the people watching to be able to lead the life—live the life that they want to live. Chris: And that's a fantastic way to do that. We put a huge emphasis on engaged living in this company. Chris: And a lot of other companies do that as well in senior living. So, that's something that you definitely, if you're ever shopping for a senior living community—that’s not one of ours or whatever, it doesn't matter—that's something you really want to ask about. Because it's really, it's so much more than four o’clock bingo. Becky: Absolutely. So much more than that. We are able to accomplish so much more, and it's very, very important. Chris: That's fantastic. And I think related to that, we talk a lot here on the show and elsewhere about the idea of socialization. So, why do you think that's so important? Becky: I think people really do need to stay connected with others. Some people are—it's different for everybody—some people are more introverted. And so, I think if you have maybe a loved one at home that is that way, maybe that means a good opportunity for a neighbor to come and visit or a church member, maybe a volunteer that has a pet—you know, pet therapy in your home. But then you have people who do enjoy the more group-type activities and socializing with a bunch of other people, and that's one of the benefits of senior living. We have a little bit of both of those options. And that just keeps people connected with one another. And that helps, you know, make their days a little more enjoyable, I think. Chris: Yeah. I think there's something to be said about waking up in the morning at whatever time you want to wake up and getting yourself ready. And then you leave out of your apartment or wherever you're living, and you're immediately greeted by people who you know and your friends and the staff members or whatever—and you're having, even if it’s just little hallway conversations throughout the day that are peppered in with the more meaningful, deep conversations that you have with people. That's different than perhaps when you're living at home and maybe you talk to a family member in the evenings on the phone or something, or maybe you talk to your mailman or somebody who comes by. It's a little bit more constant in a senior living community. Chris: The socialization is really—it’s really the key. Chris: You know, in assisted living, I think part of it is helping people to get through their activities of daily living. We talked about that on this show before. Things like getting dressed and bathing and—for the people who need that. But I think the other biggest component of senior living is the socialization factor. And there's safety and there are other things sort of tied into that, but the biggest one that you feel and see is that. Chris: It's kind of having friends. Becky: We're able to give those people opportunities to pick and choose the things that they enjoy, and get involved. One of the things I'm most passionate about is productive activities, these things that help people feel useful in either our immediate community or the greater community. We've done some projects and held meetings and supported nonprofit organizations and bought gifts for children—and things that have helped those seniors that live with us stay relevant and have a purpose in their lives. It's been really, really important. Chris: Yeah. I think that is totally fantastic. So we're talking about the wintertime blues today, and I want to get to that, but I've got a couple of comments here. I have lots of votes for the marshmallows in the hot chocolate. Chris: So, all right. Do you like the big ones or the little ones? Becky: I like the little marshmallow. Chris: The little ones, because you can take one with each sip, right? Becky: ... at one of our cocktail hours, and it was hilarious and so funny. Chris: And was there a winner? Did someone happen to have as many—did you count or? Becky: I think the winner would have been the gentleman that, within saying his sentence, several times over, ate the entire marshmallow. He kept chewing up until it was gone. It was a lot of fun, hilarious. Chris: Yeah, our daughter, she loves marshmallows. When she was little, she used to call them mar-shallows, and she was, "I want another mar-shallow." It was so cute. So, other people are talking about—in our pre-show, we were asking about what's your favorite wintertime activity? And so, we've got Dana, also, she was talking about watching stuff online earlier, and she likes watching the funny cat videos and funny kid videos on YouTube. YouTube is fantastic for that. Brandy and her spa days. Penny ... Oh, Len says Penny just likes to be somewhere warm. That's—oh, because Len and Penny are watching together. That makes sense. Let's see. Okay. Sharon says talking with friends is supposed to help against Alzheimer's. Have you heard about that? I mean, is that socialization? Becky: I haven't heard that, but I believe it. Chris: I think because you're staying in the present, right? Chris: And you're sort of, you're engaging—any time you can engage your mind. Becky: Yes. And share your life experiences, and often people who are living with dementia that wisdom from their earlier years are the memories that are the most vivid and easy to come to. And so they love to talk and to tell stories. And they feel good about telling them because those are the things they can remember well. So, that's wisdom to share. Chris: Yeah. And we're totally departing from our topic a little bit here, but just speaking about Alzheimer's, and just dementia in general, I know one of the things that we train—and as the engagement director, you are the dementia trainer in your community, right? Chris: So, all of the staff members go through dementia training, but we like to focus on what is still here, not on what is lost. Chris: I think that's important. So if someone, you know, could have dementia and is still really good at playing the piano, let them play piano, right? Chris: And that brings joy to their everyday life. Becky: This is one of the reasons I fell in love with the Arbor Company in the beginning and decided to be a part of this team. There's just such a focus on a person's best ability to function and how can we support them with just the right amount of support that keeps them as independent as possible, as long as possible, and give them just what they need? And I think that's wonderful. That's exactly what people need. Chris: Good. Yeah, I totally agree with that. So, let's get to our topic. So, Becky, I know—so, the wintertime blues, the reason we selected that as a topic is because it's kind of the theme of our engagement department, company-wide for the month of January because that's when the wintertime blues happen. So, what are the wintertime blues and what makes it—why is it different in wintertime versus any other time of the year, would you say? Becky: Well, it seems like—well, one of the biggest things I've noticed is that because the days are shorter and, of course, it's cold outside, folks aren't spending as much time outside as they have and that's a huge thing. You know, getting sunshine and a little vitamin D, and fresh air, I think is good for all of us. And when folks aren't able to spend as much time outdoors, I think it really affects them. And then like you said earlier, we're coming off of the holidays when there's been a lot hustle and bustle, a lot of family around. And once the holidays have passed, maybe those folks have gone on to their normal lives. And we're talking about, maybe I see a little bit of isolation and loneliness that happens. Also, a lot of people get sick. Think about this is flu season, it's kind of big in the news right now, and so maybe people who get sick or the family members get sick, that may mean they don't get as many visits that come over as much. I've missed a couple of visits with my family recently because they were sick and I didn't want to go over there. Chris: Yeah. You don't want to mess with that, especially with what's going on right now. Becky: Right, right. So, I think all of those things kind of have a part in why do we have this, you know, downtime after the holidays, in January especially. Chris: Yeah. And I think it's important to note: number one, to recognize it, to realize that, "Okay. Yeah. I'm feeling a little down right now." And it's okay to talk about it. Chris: It's okay. This is totally normal, that, you know, lots of people get it. It doesn't matter what your age is. Chris: And so, what I'd like to do today, if you could help us is, what are some of the things that people can do to quote-on-quote beat the wintertime blues on their own? I mean, moving into senior living is, of course, an option, but the people watching here might not be ready for that. Chris: And frankly, it might not even be the best decision for you. I mean, that's one of the things that we want to help you with in this show is to determine, is senior living the right move for you? You know, it is or it isn't. And so, how can people manage this on their own if they don't live in an environment that's designed to prevent it? Because that's kind of—senior living is sort of designed to prevent things like the wintertime blues. Becky: Sure, sure. So, I still think that getting active and getting involved is one of best first things people can do. Stay involved in their church activities or their community activities. Senior centers and the parks and rec departments have great programs for people to join. I went to a painting class not too long ago at the Parks Department, so there are good options there for you to get involved in things in the community. Chris: That's a big piece of it. Becky: ... one of the good things you can do. Chris: Another idea we were talking about is maybe having a regular meetup with friends. So, like every Wednesday, we're going to meet and have coffee and have those times, or, you know, play cards or do something regular. You mentioned staying active, so, exercise, I think, is a big piece of that. Chris: It's winter. It's cold outside. If it's cold where you are, usually, you live close enough to a shopping mall. Chris: So, you know, a lot of shopping malls have walking clubs. Becky: Go for a walk. Chris: But create your walking club. Just go there by yourself or with somebody else and walk the mall, and you can do some pretty good people watching, I think, with that. Becky: Yes. And I think inviting people over, inviting people over to your home. Then they'll know that you want some company and will feel welcome. And you'll spiffy up the house ahead of time, and it just gets you going and motivated to connect with others, and it's a good way to stay active. Chris: So, you mentioned a couple activities that you've done in your community recently. Any other fun ones that you've done that are wintertime-themed? Becky: Oh, one of the popular ones is Memories and Mimosas. Becky: So, yes. Of course, we serve mimosa and we have this about 11 o’clock in the morning, but the really cool part about this is that it's an opportunity for our resident to kind of be highlighted. So, ahead of time, I sneak and connect with someone that has a photograph or an object that's really special to them. And we talk about it a little bit ahead of time so I know what it's all about. And then we bring it to the group, and we don't tell, at first, who's in the picture or who it belongs to. And we give people the opportunity to just draw from their experiences. When you look at an old photo and when you look at the expression on someone's face, you can kind of decide things about them. And so, anyway, we do that for a little bit and then that resident has an opportunity to reveal that it belongs to them, and why it's special to them. It's one of the great activities we have in our assisted living program. Chris: Yeah. Oh, that sounds like so much fun. Becky: It's great, it's great. Chris: And you get your mimosas, and that is fantastic. Chris: So, let's go back to the comments here. We've got a few folks that are talking, a couple of people, Patrice and Sharon—separate people—mentioned going to the movies and having movie popcorn. That's a good wintertime activity. Chris: That's a good way to kind of just keep you moving, old movies particularly. Let's see. Oh, Laura Ellen has joined. Laura Ellen is our senior or Vice President of Engagement for the whole company. So, she's sending a thumbs-up and clap. Chris: You get both of those. So, yeah. So, lots of great topics, a lot of great things that you can do. Does anybody else have any ideas of things that you could do to beat the wintertime blues? And, you know, we've touched on this a bit, but I do want to mention that it's important to talk to people. Find a friend, find a family member, and be open about how you are feeling, especially if you feel that you have the wintertime blues starting to set in. Sometimes, just the act of talking about it can make all the difference in the world. Would you agree with that? Becky: I would. And I did a lot of work helping caregivers. And I think that it's really important for caregivers to recognize the signs of burnout and exhaustion, and to speak up for themselves. And to start looking before, maybe, it's too late and before they feel that and are—just have had it, to find out what resources are available in the community to give them some support and seek those out. Chris: Yeah. I think that that's super important. Or, you know, and also find a friend, find a family member or someone. And I think that anyone that you talk to about this, don't be embarrassed. First of all, everyone gets it. And second of all, I don't think anyone would judge you for having the wintertime blues. Chris: You know, you just say, "Hey, I need a friend today," right? So, today we have talked about the wintertime blues and, you know, this is kind of a cutesy name, but it really is an issue that's very real for lots of people and we don't want to discount that. Depression in seniors is a real thing. And in fact, we actually have a resource on our blog, several of them, but one of them that I picked out—and I think it speaks very well to this—we'll post a link to that below in the comments, to that blog post if you want to take a look. And it's got some other activity-type things. Similar, it’s not winter-specific, but I think it would help you out. So, we'll have a link below in the comments that I think someone is posting for you here in a moment. And also, if you type the word "SHOW," S-H-O-W, down in the comments below this video, we'll send a link to that blog post in Facebook Messenger. So, if you use Facebook Messenger, you'll get a little message from us. Hopefully, the tips we've given you will help you or other people in your life work through this wintertime lull, right? Because it's a lull, really, because the end is in sight. It's going to get warm. Groundhog Day is coming. Chris: Groundhog Day is ..
Chris: February 2nd. So, that's on Friday this week. Chris: So, we're very close to that. And how does it work? I should know this. Becky: See your shadow, six more weeks of winter, if he see's his shadow. Chris: And if he doesn't see his shadow? Becky: Then springtime is coming. Chris: Right? Like the next day, right? Becky: No. In less that six weeks, I guess. Chris: So, I do have a few more comments. Mary says ... and sorry, I don't have a way to show these on the screen—but Mary says, "Sometimes you just have to force yourself to do something, anything with your hands. Draw, paint your nails, cut up a magazine. When you work with your hands it can distract your mind and get—” Something. I can't read the rest of it. It doesn't let me here. That's technology. Laura Ellen talks about having the winter—she's had the wintertime blues in her house and recently discovered the pet store is a great inside zoo. Yeah, because, you know, the zoo can get—well, it’s too cold to be at the zoo, honestly, sometimes. Chris: And so, the puppies and other animals always bring a smile. That's good. Now, the pet store can be dangerous, right? Because you might end up with one of those puppies in your car. So, you know, if you don't want one of those, then be careful. Make sure that you trust yourself enough. Maybe leave your credit card back at home or something like that. Chris: Yeah. Danny talks about cuddling with your dog or cat. That is a fantastic one. Find a friend with a dog or cat, go to their house, and cuddle with theirs. Chris: That's the way I like to do it. I love animals, but I don't one in my house. So, I'm good with that. Trisha—these are all great, really great tips, so everybody watching, we love these. Keep them coming. Trisha says, "Reminisce with a cooking activity." So, that's fun. Have you ever done anything like this in your community where you pull in recipes from people's past? Chris: And how does that work? Becky: I had an amazing experience with one of our residents who has an Italian heritage, and she taught us how to make gnocchi. Am I saying it right? Becky: Little mashed potato dumplings. I would call it dumplings. Chris: Yeah. Dumpling, that works. Becky: And I had to go, when I got the recipe and all of the parts to it, there was a potato ricer. Chris: Okay. Kind of mix it into little balls or something. Becky: It's a kitchen tool that I had never experienced. And you put the cooked potatoes in and squish it through. It's sort of like a giant garlic press. Chris: Okay, okay. That makes sense. Chris: That sounds like so much fun. Yeah, yeah. Becky: ... her heritage and a cool recipe and kitchen gadget. Chris: Yeah. And I know a lot of people, this is a lot of the thinking that goes on in people's head, particularly women, who are thinking about moving into senior living, it's like, "I love to cook and I won't get the opportunity to do that anymore." And some communities have little kitchens in the apartments. Some don't. It just depends. But there are options and things like this where you can, you know, cook or bake or do something, and share your love of cooking with other people. You just don't necessarily have to it on a daily basis. You have opportunities to do that. Chris: So I bet there was a smile on her face that day. Becky: ... make chocolate, milk chocolate and dip things, and all sorts of opportunities to still do a little bit of that, that they've loved. Chris: Well, we've got more comments coming in. Robert says, "No one dog is enough." I would agree with you, I just—not in my house. I have two small children, and I have enough things to clean up after. Becky: There is a house full. Chris: And so, you know, I think we're good with that. Joy talked about recently joining a bowling league. Chris: That's a fantastic way. Yeah. You've got some, a little bit of athletic, you've got a little bit of competition, friendly competition, you've got friends, you got the bowling league, go out to lunch afterwards, you know. There are lots of opportunity for that. And a bowling game is a long—it's a pretty, it’s a good afternoon. Becky: Yes, it is, it is. Chris: So, that’s a fantastic day. And then Mary talks about making a playlist of some of your very favorite songs and listen to it often. That's another good one, right? Chris: Yeah. So, and maybe this is a good time of the year to listen to, like, the Jimmy Buffet type of things where you're thinking about the beach a little more. Becky: Thinking about the beach. Yes. Chris: And, you know, you'll be there soon enough and thinking about that, all of that. Well, if something that we said today makes you think that you want to explore senior living more, we would love to invite you to one of our communities or really any other senior living community that's close to you. You may not live next to one of the Arbor Company communities and that's fine. There are people there like Becky who are skilled in these things and they're really there to help you. And I think as you are looking for any senior living community—and that's, by the way, something that we do want to focus on in a future show is, how do you shop for senior living? What are the things that you should look for? And one of things that we believe you should look for is a really rocking engagement program. Chris: Because that is what you do day in and day out. And if only they have, you know, bridge on Wednesday afternoons and bingo, maybe you like those things, but that's not enough to really keep your mind active and engaged. Becky: That's not enough. You're right, there's so much more. We've learned so many more ways to bring in those engaging opportunities to people and that is a huge part of the day-to-day living and the benefit, one of the huge benefits of senior living. So it's definitely something to focus on. You want to find out on who's leading these programs and meet them? Find out what's going on, how you get your loved one involved. And like you said, we're totally open, although we program and do activities for our residents, we're always open to visitors to come and check it out and do an activity with us or to come get some good ideas, join our support group for caregivers to find out some ways. Chris: And that something else that you should look for in a community is the ability to try it out for size and to come in and look at things. Becky: Absolutely. Sure. It's a big choice. Chris: Yeah. That's fantastic. So, if you have any questions that we didn't answer for you today, please leave those in the comments. Keep those suggestions coming, too. But leave those questions in the comments and we'll be sure to cover those in a future show. Or if you think of any topics that you would like for us to cover here, we will add it to the schedule, put on our calendar, we'll get the right person sitting next to me that's the expert like Becky, and we'll go to town with it. Our next show is going to be next Wednesday. That's February 7th at 6 p.m. Eastern. And if you want to be notified to get a reminder when we go live, just type the word "SHOW," S-H-O-W, below in the comments, and I'll make sure that you get that. And if you saw anything today that you think someone else may find helpful, please share this video with them or mention their name in the comments and that will help them to see it. We want to get this information out so that we can help as many people as possible. And it's really about helping you live the life that you want to live. Well, I think that just about does it for us today. Hopefully, the Groundhog sees his shadow, right? Becky: Spring is coming soon. Chris: Spring is coming soon. Well, I think that's it. I will see you next Wednesday. Bye-bye, everybody.